Monkey Bars are a great, new to me, way to use up overripe bananas. 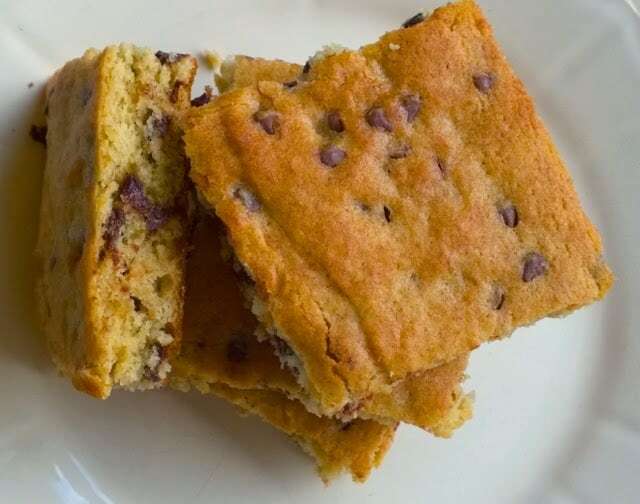 I’ve got my fave Chocolate Chip Banana Bread with Streusel and my famous Banana Cake Roll but these simple little banana bars are perfect for lunch boxes. 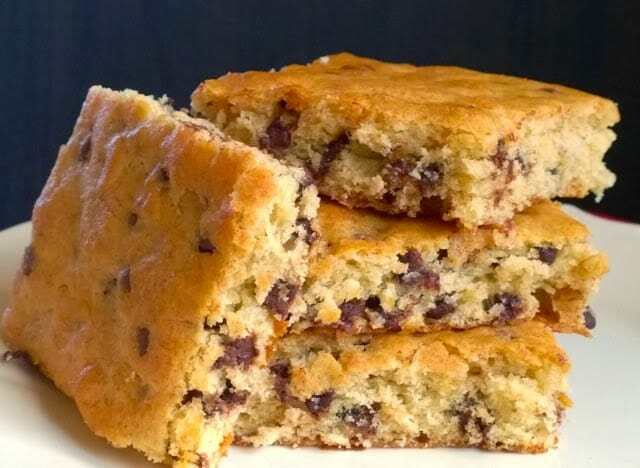 They come together quickly, use up extra bananas and taste like a little banana cake with bits of chocolate. I buy a lot of bananas to keep our banana eater happy. We only have one dedicated banana eater so sometimes they get overripe. These banana bars are the perfect way to use them up. I usually end up freezing extra bananas so making bars gets them out of the freezer. 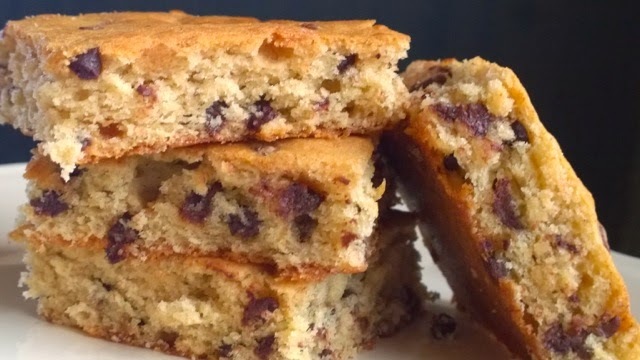 If you’re looking for something ELSE to do with bananas these little banana cake bars are it! I was reading something, somewhere, I’m not even sure where or I’d totally give credit where credit is due, about making Monkey Bars. I was confused at first, how would you pop in the kitchen and make a piece of playground equipment? Then I caught on, oh yes, some tasty little cake bars, with overripe bananas? Yes, Yes tell me more! There seems to be a plethora of uncomplicated recipes for Monkey Bars out there. 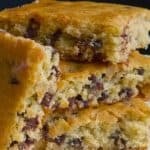 I browsed them, a lot of them, it’s what I do, and noticed most of the ingredients were just pantry staples with the exception of mini chocolate chips, that is. I happened to HAVE mini chocolate chips on hand, and overripe bananas too, so I mean really I was meant to make these, right? It’s all connected; I read about them+had overripe bananas+read up on them+possessed all the ingredients=MUST MAKE STRAIGHT AWAY. I did, they are awesome and now I have to go ride my bike for 37 miles to burn them off. Ahem. Monkey Bars are a great, new to me, way to use up overripe bananas, thank goodness too because we only have one dedicated banana eater in the house and they're always getting too ripe before he eats them all. 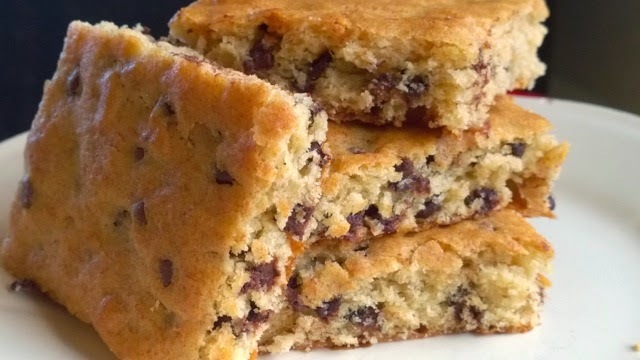 These would be a brilliant addition to any bake sale you might be planning. They’re original, the recipe makes a nice amount to sell, and they land somewhere between a banana cake and a banana bar. They’re also easily wrapped. Bake Sale WIN right there folks. Would you mind pinning this recipe?!? Thanks so much! Oh Laura my kids are banana fanatics and would LOVE these! Pinning to try! These totally have me making monkey sounds! Pinned for when I have leftover bananas hanging around! So since these are bananas, they’re healthy right?! Yum!